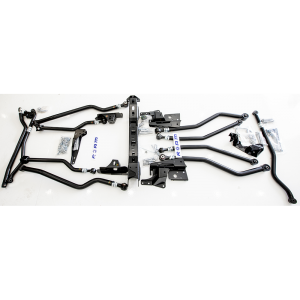 The ROAM JL Side Armor Steps are constructed from laser cut high strength steel (mixed 7/32″ and 1/4″ high strength steel brackets) (and mixed 1/8″ and 5/32″ high strength steel topside outer surfaces) and are seam welded along the step plates for ultimate strength. No drilling, cutting, or welding is required for installation. The ROAM JL Side Armor Steps are precision laser cut and profiled on the interior edge to evenly and consistently follow the curvature of the vehicle. Features an easy no drill installation, a tough non-slip step plate design, and integrated LED lighting mounts. Powdercoated with a 2 stage textured poly powdercoat for durability. Exceeds all OE specifications for resistance to the elements. Made with pride in the U. S. of A. – On our JL Side Armor Steps, the mounting brackets sit higher than the lowest part of the OE body mount brackets. 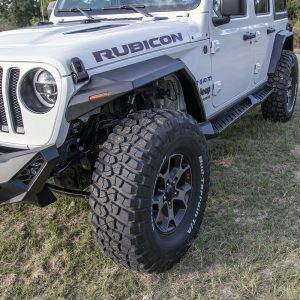 – What sets our design, build process, and quality apart isn’t just how strong our JL Side Armor Steps are, but rather how they’re designed and built. They’re profiled and precision laser cut on the interior edge to evenly and consistently follow the curvature of the vehicle.